good artbox: Day 9 - Have you been in awe lately? Day 9 - Have you been in awe lately? I finally captured a photo of a rainbow today. Yay!! I was starting to wonder why I never got a photo of a rainbow in the sky. Well, today was my day and thankfully my phone was charged. Because I worked today, I am too tired to draw a rainbow so I am going to post this long awaited picture that I got today. Let's talk about the rainbow for a minute, shall we? After work today, nature decided to pour down a ton of rain. It rained so hard that I put on my hazard lights because it was very blurry trying to see through the downpour. I asked the Lord to stop the rain. Although the rain didn't stop immediately, it did let up a bit. Then it was back to the downpour. What gave me a bit of hope was the clear clouds that I saw in the sky up ahead and I knew the rain would stop eventually. And praise the Lord it did finally stop. I do not like driving in rain and especially a whole lot of rain. Well, fast forward to further down the highway after the rain, and what do I see? Yes, girl a rainbow!!! Let's scream together! aaaaaaaaaaaaaaaaaaaaaaaaaaaaaaaaaaaaaa!!! And then I thought about "being in awe of the Most High God". 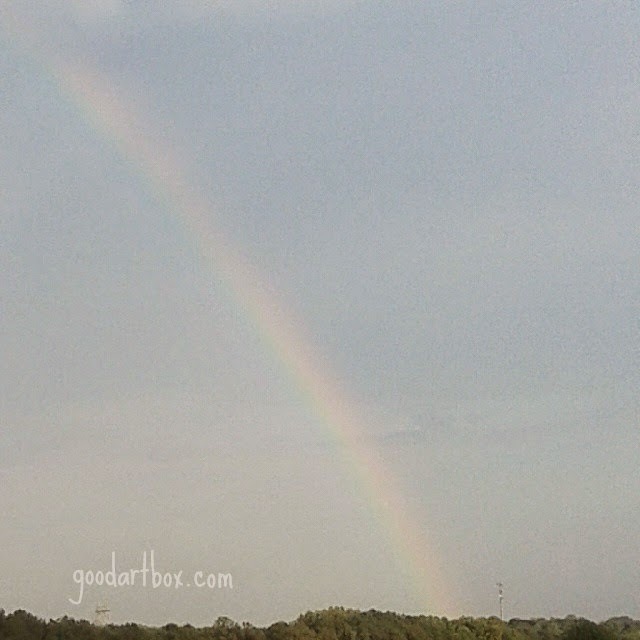 ...because quietly and majesticly, the rainbow appeared. I was in awe because there it was. The promise. Right before my eyes. Have you been in awe lately by Him?